Orwell’s parable of sorts is excruciating to read – the racism accompanying Britain’s colonial period is always at the surface and the details around the shooting are brutally inhumane.. This brief summary, however, illustrates one point made by Orwell with regards to people in positions of authority – particularly police – and how they might handle certain situations regardless of the level of crisis presented in a tense circumstance. Have we come to expect a military-styled “mask” from our police? Does social media heighten the expectation of lethal force by law enforcement? Do we expect professionalism from our law enforcement – a measured, thorough, and considered response with lethal force as only a last resort? Do we engage with law enforcement in positive and encouraging ways in an effort to build overall trust in the community? How can the media – tv, newspapers, facebook, twitter, etc – help, rather than hinder, this effort? With a position of authority come responsibilities that can vary according to the population and demographics. Technology has created a demand for transparency and accountability that many cities, states, and agencies are only just understanding the implications. Journalist Ben Montgomery wanted to know why no one was keeping track of police shootings in the country’s third largest state.He found that, while plenty of data was available for crimes like thefts and purse snatching, little data was tracked on police shootings, whether it was by Florida’s Department of Law Enforcement, the FBI, or the US Department of Justice. With Florida’s generous laws relative to Freedom of Information (FOI) requests (sadly, not the case in South Carolina), he reached out to law enforcement agencies in every Florida county, and secured more than 10,000 pages of police reports on shootings occurring between 2009 and 2014 where police officers were involved. By the time Montgomery had added media reports, court files, and interviews, the Times had a comprehensive database covering a longer period of time than any others compiled in recent years. The website provides case studies, video, and demographic data to zero in on circumstances when police shoot. Prior to the series publication in print, (April 2017), Ben Montgomery previewed some of his “Why Cops Shoot” research over the airwaves through a pair of podcasts (here and here) produced by the team at WNYC’s RadioLab. Standing out in Part 1 is the segment featuring former Daytona police chief Michael Chitwood (now sheriff of Volusia County). Chitwood’s ten-year stint as chief resulted in an alignment of the department’s arrest data with the city’s demographics-60% white and 40% black. Contrast this with the City of Charleston with a population that is 67.4% white and 26.9% black. Police department data indicates that between 2009 and 2017, a total of 69,000 arrests were made with 44% white and 56% black. Many of Chitwood’s strategies are reflected in the “Guiding Principles on Use of Force” issued by the Police Executive Research Forum (PERF) in 2016. While many officers agree with the principles, the Fraternal Order of Police and the International Association of Chiefs of Police have vocally been critical of some of the 30 guidelines. But, Chitwood defends them based on his experience as Daytona Beach’s Chief of Police. The city has a population of 62,300 permanent residents and a daytime population of 120,000. It has 8-9 million visitors a year. It is known for its raucous Spring Break crowds, NASCAR’s Daytona 500, and Bike Week, which brings some 500,000 rowdy bikers to town for 10 days every year. “But the city had just four police shooting incidents between 2009 and 2014. Three of the Daytona shootings involved an armed suspect who was endangering lives; the other person shot had crashed into a car, led police on a chase and drove at an officer.” No other city of its size can even compare. Rosenstein’s substitution indicated that investment in building trust does not appear to be a priority for the current administration’s Justice Department. It may have been a reflection of what Ron Weitzer, a criminologist at George Washington University, noted in the Marshall Project piece – while some whites are shocked by incidents involving police misconduct or killings of blacks, many compartmentalize incidents as isolated or associate crime with minorities, and, as a result, remain confident in law enforcement. Unfortunately, the heavy lifting of changing “hearts and minds” must rely solely on efforts put forth within communities and through the media and other resources. Missouri House Representative Shamed Dogan recently contributed an opinion piece in the National Review, “Pro-Black, Pro-Police Reforms One Year Later.” He echoed Rosenstein’s support of police, noting his sponsorship of a Blue Alert law in Missouri, whereby the public is notified whenever an officer is attacked. He has also pressed for pay increases for police officers (see the Charleston City Paper for a local perspective on this). In the RadioLab podcast introduction Ben Montgomery notes that the total number of police shootings in Florida, in the six-year time period from 2009 to 2014, is generally flat, even though media reporting would suggest that the numbers have been increasing. But, the greater likelihood of being black and being shot by police is covered in a special section on “Why Cops Shoot,” and it zeroes in on racial profiling. Journalists Neil Bedi and Connie Humburg process the data and find that the disparities between black and white people who are shot remains higher than population statistics would support. While whites outnumber blacks 3 to 1 in the state of Florida, blacks are a disproportionate number of those shot. And, in those cases where the causes are debatable – when the person is unarmed; pulled over for a minor traffic violation; thought to be reaching for a weapon (but not); chased on foot; or, suspected of a minor crime like smoking pot or merely nothing at all – blacks are two to three times as likely to be shot. 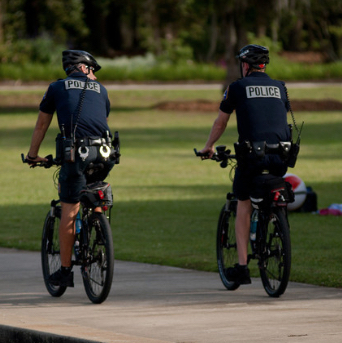 Recent debates at City Council meetings in Charleston, South Carolina are illustrative of the schism between whites and blacks on the topic of law enforcement. The Charleston Area Justice Ministry (CAJM), drawing on data that illustrates a disproportionate number of blacks involved in law enforcement activities, has repeatedly encouraged the City to hire an outside auditing firm to assess racial profiling levels in the Police Department. The Police Department has been resistant to these efforts, pointing to its Illumination Project as an action plan for community building that was developed over the course of a year in neighborhood meetings throughout the city between residents and police. It is thorough, data-driven, and purposeful in an effort to establish a strong community policing effort in the City of Charleston. With the retirement of Police Chief Gregory Mullen, the city of Charleston is at a crossroads, no less than when long term Chief Reuben Greenberg retired. A new police chief will be faced with a fast growing city where residents and tourists are often opponents on the city stage. Leadership at the community level should be fostered and law enforcement must see the possibilities that exist to make the city a vibrant and livable place for all. The plans are in place to strengthen community and police relationships. But the realities of race will remain a stubborn obstacle within our community until we recognize the issues and work to change them.